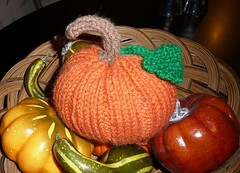 It's not like I couldn't go buy a real or fake pumkin, but where would I ever find a knitted one? LOL. Anyway, this little guy was a lunch time project resulting in a fun addition to my fake gords in my Autumn center piece.